Can Microsoft's complete refresh of Hotmail take on Google's uber-popular Gmail service? It's an unfortunate truth, but Hotmail isn't so hot any more. Microsoft acquired the growing webmail service in 1997 and by the early-2000s an @hotmail.com email address had become as essential as a Geocities webpage. Despite competition from the likes of Yahoo and Lycos, Hotmail continued to rule the roost. Then Google ruined everything. In 2004 the search giant launched Gmail, which provided a clean interface and capacious storage. Users flocked in their millions and Gmail continues to be the most popular webmail service, claiming 425 million active users over Hotmail's 350 million. Yahoo! has slipped behind with a user base of about 300 million. It's crucial, then, that Hotmail evolves to keep up with Google. Its latest refresh is a big one, ditching the Hotmail name and rebranding the service to Outlook.com in line with its ubiquitous Office email offering. It's notable that Hotmail has had major changes in aesthetics and functionality since its inception, whereas Gmail has looked pretty much the same since it first launched eight years ago. 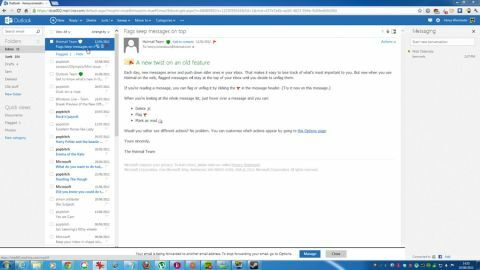 Outlook.com marks a big departure from Hotmail's look and feel. The basic layout remains, but it certainly takes a lot from Gmail's less cluttered approach. To the left you'll find your folders and search box, and the centre is dominated by the emails themselves. Click on one of these and it dominates the screen, but you can switch to a pane view - à la Office Outlook - via the settings cog to the upper right. At the time of writing there's an annoying bit of unused space to the right of the screen. Presumably this will make way for adverts once the preview period's finished, but you can fill the space with Microsoft's Windows Live Messenger, which is retitled 'Messaging'. It doesn't work quite as we expected it to; chat is initiated by typing a friend's name, rather than choosing from a list. Although Microsoft has dropped the Metro name, Outlook.com closely follows its design language, which is also found in Windows 8, Windows Phones and the Xbox 360. It's dominated by bold colours and Microsoft's signature Segoe font. It's a distinctive, divisive look - and one that doesn't quite sit properly with Windows 7's more traditional and translucent theme. Outlook.com brings with it some new features with its redesign, most of which seem to have been nabbed squarely from Gmail. Navigation can now be accomplished using keyboard shortcuts, which can tellingly be customised to match those of Gmail. Likewise, complex searches (for example, from:someone@somewhere.com) are possible. Gmail includes previews of content such as YouTube videos and Flickr photos within emails, but this must be enabled from Gmail's experimental labs section. In Outlook.com it's enabled by default and termed 'Active view'. It's a handy feature, especially if you're forever being emailed 'funny' videos of cats. Online document editing has taken off recently, especially with the launch of Google Docs and Microsoft's own support for document and spreadsheet editing within SkyDrive. Outlook.com brings similar functionality, with the ability to open and edit documents from within the webmail system. Skype - Microsoft's big acquisition of 2011 - will be supported in the future, but it's not currently integrated into Outlook.com. Gmail offers a similar service with its Google Talk feature, but anecdotal evidence suggests Skype is still the communications tool of choice, especially in the world of start-ups. It's here that Microsoft could potentially pull some users away from Google, especially if it can run Skype without the need for users to install its rather intrusive software. If it feels as if we're comparing Outlook.com to Gmail rather a lot, it's because Google's polished and fluid email service is our only real reference point here. Yahoo! 's offering seems to be stuck in about 2003 and its lack of penetration into the mobile market means that it's probably going to eventually slide into obscurity. Outlook.com is certainly the bolstering Hotmail needs to compete with the big G. It's just a shame that the service has been improved with such a bald cloning of Gmail's best features, rather than genuinely trying to improve and innovate webmail. It may not set the world on fire, but Microsoft has raised the temperature from lukewarm to a gentle simmer.